Adjusted EBITDA is a financial metric utilized in the calculation of the first lien leverage ratio as defined in the Company's senior secured credit facilities. While the determination of appropriate adjustments in the calculation of Adjusted EBITDA is subject to interpretation under the terms of the Credit Facility, management believes the adjustments described above are in accordance with the covenants in the Credit Facility. Adjusted EBITDA should not be considered in isolation or construed as an alternative to our net income (loss) or other measures as determined in accordance with GAAP. In addition, other companies in our industry or across different industries may calculate bank covenants and related definitions differently than we do, limiting the usefulness of our calculation of Adjusted EBITDA as a comparative measure. 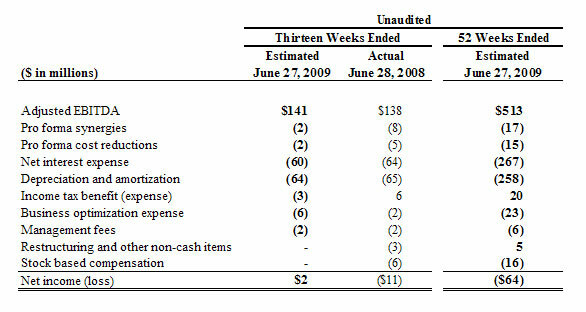 At June 27, 2009, the Company had estimated $29 million of cash and $70 million outstanding on the revolving credit facility providing unused borrowing capacity of $280 million under the revolving line of credit subject to the solvency of our lenders to fund their obligations and our borrowing base calculations.